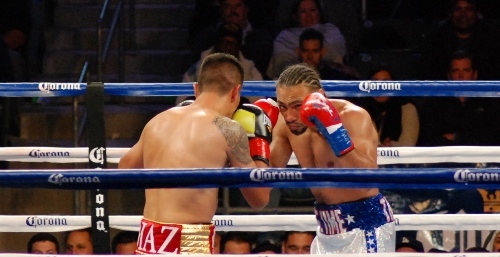 Keith Thurman (right) and Julio Diaz size each other up. CARSON, CA, April, 26, 2014 — Keith Thurman lived up to his nickname of “One Time” with a blistering 3 round performance that left Julio Diaz unable to continue due to a Rib injury after 3 rounds of rapid give and take boxing. The crowd at the Stubhub center in Carson California were disappointed in the brevity of the main event but there was solace in the fact that the co-main event was arguably the Fight of the year to date and will be difficult to top for the rest.